Explore the map of Arizona, a state in the southwestern region of the USA. It is the 6th largest and the 14th most populous state of the United States. Arizona is one of the Four Corners states and its capital, and largest city is Phoenix. AZ became a state on 14th February 1912. The state is known for the Grand Canyon and copper. Our Arizona map is well-defined, letting you identify different places with ease, including the best places to visit! : Getting to know Arizona becomes much easier and interesting with our elaborate and informative map of the state. The Map of Arizona will get you acquainted with every detail of Arizona such as the key attractions, infrastructure, physical features, tourists destinations, state capital, important towns, and many other aspect. The official flag of Arizona consists of 13 stripes of the colors red and yellow alternately. There is a 5 point star in the center of the blue background. It was adopted on 25th January 1917. 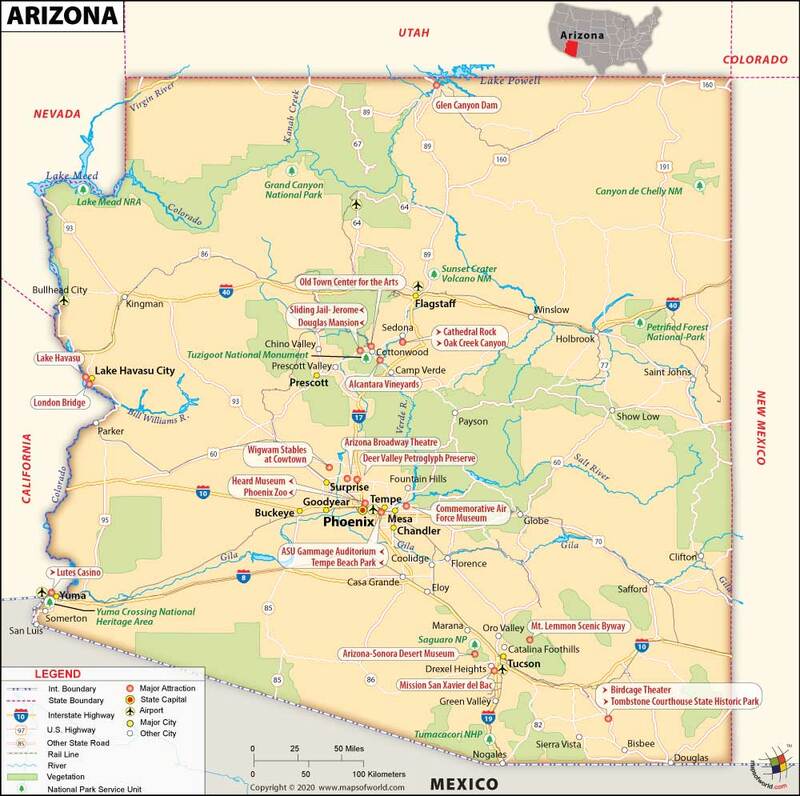 Often times referred to as the Italy of America, Arizona is located in the southwestern region of the United States. The 6th largest state in the country in terms of area, Arizona is also the 14th most populous state comprising a population of 6,828,065 as of 2015. Phoenix is the capital of Arizona as well as its largest city. Arizona consists 15 counties. It is also known as the Grand Canyon State. Originally inhabited by Native American tribes, Europeans began arriving in the region in the 16th century. Spanish Franciscan Marcos de Niza, who made contact with the native people in 1539, was the first European to enter the state. In 1752, Spain founded fortified towns at Tubac and in 1775 at Tucson. With Mexico achieving its independence from Spain in 1821, the region that now comprises Arizona became a part of the new nation's Territory of Nueva California. It also came to be known as Alta California. Following the defeat of Spain in the Mexican-American War, the land was ceded to the United States in 1848 and in 1863, it became a separate territory. On February 14, 1912, Arizona became a US state and was the 48th state to be admitted to the Union. During the American Civil War, Arizona was a Confederate Territory. During World War 2, Arizona was also the site of German POW camps and Japanese-American internment camps. Arizona covers an area of 113,990 square miles. It shares its borders with the US states of New Mexico, Nevada, Utah, California and one point common with Colorado. It also shares an international border with Mexico. Southern Arizona has a desert type of climate where the summers are very hot while the winters are mild. Around 27 percent of Arizona is covered by forests. The state is also dotted with mountains and plateaus. With a height of 2,637 feet, Humphreys Peak is the highest point in the state. Forests of pine, Douglas fir and spruce trees can be found in the northern part of the state. In the areas of Flagstaff, Alpine and Tucson, one can also come across ski resorts, while the state is also known for its abundance of national forests and national parks. Grand Canyon is one of the most popular tourist spots and is known for its spectacular landscape. At Tumacacori National Historical Park are preserved the ruins of three early Spanish colonial missions. At Organ Pipe Cactus National Monument, one would come across around 30 different species of cactus. Other places worth visiting are Saguaro National Park, Petrified Forest National Park, Bisbee, Canyon De Chelly National Monument, Havasu Falls, Jerome, among others. Phoenix Sky Harbor International Airport is the 7th busiest airport in the world. Another popular airport is Tucson International Airport. Bus services are provided by Greyhound lines which serve Phoenix, Tucson, Flagstaff, Yuma, and certain other areas. Valley Metro Rail connects Phoenix with Tempe and Mesa. The northern part of the state is served by Amtrak Southwest Chief. The Texas Eagle and Sunset Limited serve South-Central Arizona. There are more than 200 local school districts in Arizona. There are three public universities which include Arizona State University, University of Arizona, and Northern Arizona University. Arizona was the last of the contiguous states admitted to the Union. About one-quarter of Arizona comprises Indian reservations.